The Bamun area is like the Bamileke a part of the Cameroon Grassland. 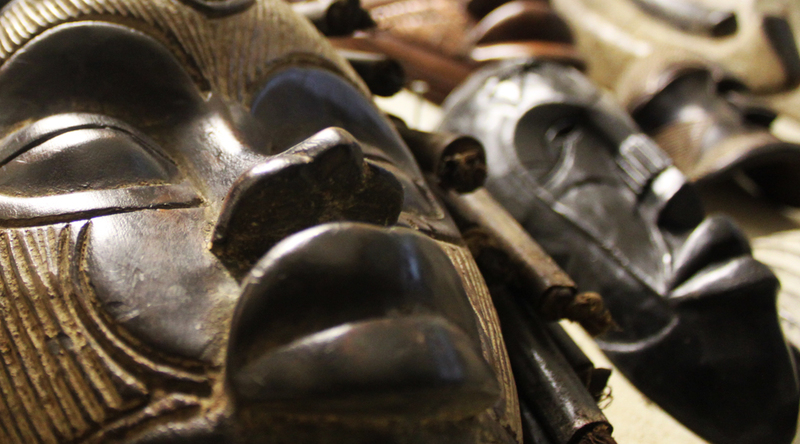 The Bamum produced large figures encrusted with beads and cowries. Noteworthy elephant heads cast in bronze. There are also; dance masks in the form of a long head and a high neck, also in animal-head form; footstools and thrones decorated and supported by animal or human figures. In the small kingdom of Bangwa, the heads of statues and masks feature puffed-out cheeks. The very characteristic sculpture in the round attains its apogee in a depiction of a horn-player who wears traditional headgear in the shape of a tiara; the thick double arc of his eyebrows overhang, and the mouth is treated in parallelepipedal relief under a heavy nose featuring well-shaped nostrils. The wood used for masks is not always completely hollowed out, for the mask does not cover the face of the wearer but rather tops a kind of bamboo cage surrounded by a tufted collar of palm fibers, which conceals the head. These masks, instruments of societies with political, administrative, judicial, or theatrical functions, were kept in special storage houses; they were brought out at the first rainfall. Then, the king himself would appear masked and dancing. The buffalo joins the leopard, elephant, and two-headed python as an image of royal power is frequently found in the decoration of works from the region.